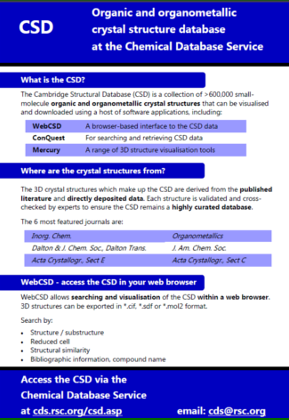 The 3D crystal structures which make up the CSD are derived from the published literature and directly deposited data. Each structure is validated and cross-checked by experts to ensure the CSD remains a highly curated database. WebCSD allows searching and visualisation of the CSD within a web browser. 3D structures can be exported in *.cif, *.sdf or *.mol2 format.